Thought eaters are described as "unintelligent." 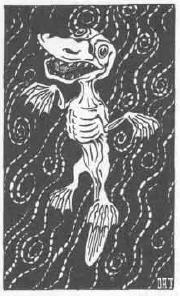 Never has a D&D artist better captured a concept in his portrayal of a monster. This sad, pathetic wretch of a creature just screams, "Please, kill me!" How to use it: The revised Thought Eater published in 3rd Edition is a successful incarnation of this monster - it looks less like a platypus and more like an eldritch horror taken from Ancient Egyptian mythos. A denizen of the Ethereal plane, the Thought Eater feeds on psychic energy; it can only spend a few rounds in the material plane before its semi-corporeal flesh begins to slough off from its body.